her body with the next level of love. in diamond blue, the colour of the hardest thing. her hope glows where it leapt in her diamond throat. all that was once hip in Elvis, Marley, Hendrix. cries a halleluiah, a returning hymn. becomes ink-stain, now, for surviving the storm. did not have this knowledge of you. Most of the poems explore women’s tattoos. Men’s tattoos are observed and their reasons speculated on rather than voiced or detailed. The subject is those who have voluntarily tattooed themselves. Slave and prison tattoos are outside the locus of this volume and would dilute its purpose. 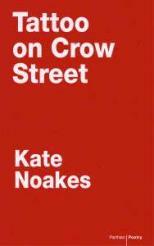 Tattoo on Crow Street sticks tightly to its theme and is stronger for it. The voices and stories feel real. The tattoos themselves come to life in a focused, sensual collection.